The development and construction of Maryland's first wind power project—the 70 MW Criterion wind project—involved Constellation Energy getting plugged in to the local community in a big way. The 28 Clipper Liberty 2.5-megawatt wind turbines were erected along an eight-mile section of Backbone Mountain, a ridgeline within the Appalachian Mountain range. The elevation is fairly high, between 3100 and 3200 feet. Sometimes, getting a wind power project plugged in to the local community can involve some bull—four-legged bull, that is. That was the case with Constellation Energy's Criterion wind power project in rural Maryland, the first operational wind power project in the state. To underline the utility's commitment to the town of Oakland and the townspeople, the company purchased one of the grand champion steers at the local 4-H livestock sale—and promptly donated the steer back to the 4-H.
"We've reached out to the community in a number of different ways, to show them that we are there for the long term, and that we want to help support events that are important to people in Oakland," explains Criterion facility manager, Don Shilobod. 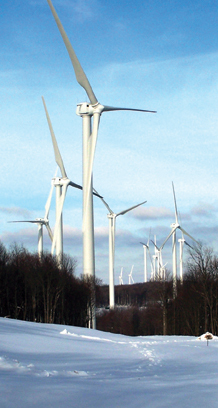 What is now a 70 MW project turning its turbine blades had its origins back in 2001/2002, when wind turbine manufacturer Clipper Windpower initiated wind studies on the site in western Maryland. The studies took about four years to complete. "By 2006, Clipper had come up with some average wind speed velocities, and working the numbers, they realized it would be a good wind project site," says Shilobod. Constellation Energy (based in Baltimore, at the other end of Maryland) became aware of the project. "The fact that it was a renewable energy project and that it was right here in Maryland really fit well, and it was an attractive project for the company," explained Shilobod. They acted on it quickly, approving the purchase of the development project in 2009. While Constellation does some of its own project development work, Shilobod explained that it has a blended approach, with some projects being initiated by the company and others purchased from project developers. Constellation has a development team, and team members are always on the lookout for projects. They have extensive contacts with development companies, so they know what is going on within the industry, and which projects are being developed. "They will look at these projects to see if they fit the strategic growth of Constellation, where a project is in a region where electrical power is needed or where revenues are going to be strong," says Shilobod. "If there is interest on our part, we'll ask more questions about the development and the project, and then perform due diligence on the equipment, energy contracts, fuel contracts, whatever is required. We're always looking for projects that fit our long term plan for growth and power generation." Although electrical demand has been constrained of late due to the economic downturn, Constellation has a long term horizon—which is appropriate, when you consider the company has its roots as the nation's first gas light utility. It has since evolved into one of the largest energy companies in America, with 12,000 megawatts of generation capacity. It had revenue of $14.3 billion in 2010. Alabama, California, Utah, and Alberta, Canada. The company's growing clean-energy portfolio includes approximately 1,000 megawatts of renewable power generation owned or under contract, including utility-scale solar, hydro, wind, and biomass power plants. Constellation also works with commercial customers to develop distributed solar solutions. Approximately 60 megawatts of solar installations owned and operated by Constellation have been completed or are under development for customers. There was plenty of solid wind power criteria for building Criterion Wind on this site in western Maryland. "We have a fairly steady wind source," says Shilobod. "The annual average wind speed is 8.5 meters per second. The summer is kind of a valley season, with generation lowest during June through August. But it starts to pick up again in September, with October, November, and December being strong months, right through to February." The 28 Clipper Liberty 2.5-megawatt wind turbines are sited along an eight-mile section of Backbone Mountain, a ridgeline within the Appalachian Mountain range. The elevation is fairly high, between 3100 and 3200 feet. "We're not at the peak height of the ridgeline, but we're pretty darn close," says Shilobod. The site is in the far western part of Maryland—geographically, the far west part of the state has a panhandle, with West Virginia surrounding it on three sides. Since this was the first wind power project for Maryland, Constellation undertook a bit of an education process with state and local government officials. It was quick to get support at the state level, says Shilobod. "The state government and the state legislature were excited to hear about a wind project being built in Maryland, and they were strong proponents of renewable energy in the state." He said there was some controversy at the local level about a wind project, with concern about the impact wind turbines might have on the viewscape of the ridgeline. Tourism is a major industry in the area, with the Deep Creek Lake Area attracting boaters and hikers. But the company, he said, went the distance with local people to explain the benefits of the project, and that it would have a minimal impact. "We had pretty widespread outreach to the community." Constellation took over the land easements that Clipper had arranged with local landowners for the project. There are a total of about 25 landowners involved with the entire project, about half of which have turbines sited on their property. "They were on board with the project from the very beginning," says Shilobod. "And our outreach to them was immediate upon Constellation closing the deal for the project. "We kept them informed, in advance, of the groundbreaking and construction, along with the local government, the county commissioners, the roads department, the local planning boards, and the local sheriffs. All facets of local government were informed of the progress of the project." Many in local government understood, and appreciated, the project and the tax revenue, jobs, and economic benefits the wind project would bring. "We had to apply for building permits and grading permits, so this brought us into contact with local government almost immediately, and we worked closely with them. We had many oversized loads—large tower sections, turbine components—travelling on the local highways and secondary roads. We kept local government officials informed of the schedules coming up and asked for local assistance from the local sheriffs and state police." Illustrating their commitment to the community, the company and its employees got involved with local charities, the arts festival—and the aforementioned 4-H livestock sale. They hired local workers and, as much as possible, sourced construction materials such as gravel, cement, concrete, and rebar, locally within the county. "Our spending in the community approached $10 million," says Shilabod. Significant numbers when you consider that as the largest town in the area, Oakland has only about 2,000 residents. The construction project itself was divided into three different sections. A look at the North Section shows some of the challenges construction crews faced. The North Section has 11 turbines and mature forests on top of the ridge. A logging road had been built into the area, but it was just a single lane road, so it had to be widened and graded properly. Having completed construction of Criterion Wind, Constellation Energy has shifted renewable gears a bit and started construction on a large commercial solar installation, also in western Maryland. As part of the state of Maryland's Generating Clean Horizons initiative, Constellation Energy is developing a 17.4 megawatt solar photovoltaic power installation on land leased from Mount St. Mary's University. The state of Maryland will utilize 16.1 megawatts from the system, and 1.3 megawatts of power will go to the university. The approximately $60 million solar facility will be constructed, owned, operated, and maintained by Constellation Energy. Renewable electricity produced by the system will be purchased by the state of Maryland and Mount St. Mary's under long-term Power Purchase Agreements. The system is expected to be completed in early 2012 and will be the largest solar photovoltaic installation in Maryland. When they started the road work in April 2010, there was still snow on the ground, reports Shilobod. "We were coming out of one of the heaviest winters the area had seen, with close to 295 inches of snow for the year. The excavators had to dig through snow, ice, and mud. Clearing the land for the turbines went fairly quickly, but it was really the access road that was the challenge. "Before we brought the turbines in, we had to bring in heavy equipment, trucks to haul debris, logging trucks, and grinders to grind up tree stumps that were cleared from the sites. Once the rock excavators cut the road, they then had to break up the hard stone beneath the soil for the turbine foundations." Having a lot of rock worked in their favor to some degree. "When you're able to pour the concrete foundation on solid bedrock, you're in a much better position to have strength and durability for the wind turbine towers." One site posed an extra challenge, he said. "As we were excavating the foundation area, we began to hit porous areas in the bedrock—and then we hit an empty pocket with the excavator bucket. That required us to refine the engineering process for that one site; we bored micro-piles deeper than the original foundation would have gone down, and we poured additional concrete." Before any of this work was done, however, all of the plans had to be approved by the U.S. Fish and Wildlife Service, to ensure endangered species habitat areas were not disturbed. There were two turbines that were in a habitat area for the Indiana Bat, an endangered species. "We had to work around that area until studies were completed to prove that, although these were habitat areas for the Indiana Bat, the number is not high enough to warrant stopping the project. That basically then gave us the green light to proceed with tree clearing and turbine construction." Constellation Energy has been working with the U.S. Fish and Wildlife Service for about a year to obtain an Incidental Take Permit with regard to the Indiana bat. This is a proactive move on the company's part and is in addition to intensive studies it has done—and continues to do—to protect bats and other wildlife. The heavy snowfall of the previous winter was motivation to get the project done by the fall. "Construction began in April, and the first foundation was poured in June," explains Shilobod. "So we had a tight construction schedule of getting 28 wind turbines erected. While we did not have snow or ice impact us, it did impact the construction schedule from the point of view that if we did not get the turbines erected by mid-October, we would have faced a harder challenge of erecting them the later we got into the year." It spurred the construction team to hire a second erection crane. "It turned out to be a good decision because the very last turbine was erected October 2. We didn't want to be doing that work in harsher weather. You can't be lifting 300 foot diameter rotors when the winds are at 20 or 30 mph." Cooperative for energy and renewable energy credits produced by the Criterion wind project. Old Dominion is a wholsale power provider serving public electric cooperatives in Maryland, Delaware, and Virginia. The power gets to Old Dominion via a 138 kW transmission line owned by Allegheny Power Systems that passes over the ridge line. "So the transmission was available, but with the wind project, we needed a new substation to collect energy from the turbines," explained Shilabod. "Based on scheduling, we took it upon ourselves to build the utility side of that substation, which is centrally located between the three turbine clusters, and we built it to Allegheny Power standards." Aristeo Construction, of Livonia, Michigan, had the EPC contract for road construction, foundation placement, turbine erection, collection systems, and substation work. Another Michigan-based company, M. J. Electric, LLC, was the electrical sub-contractor on the project. While the Criterion Wind project is part of Constellation Energy's commitment to renewable energy, it also goes toward Maryland's own renewable energy goal, achieving 20 percent renewable energy by 2022. 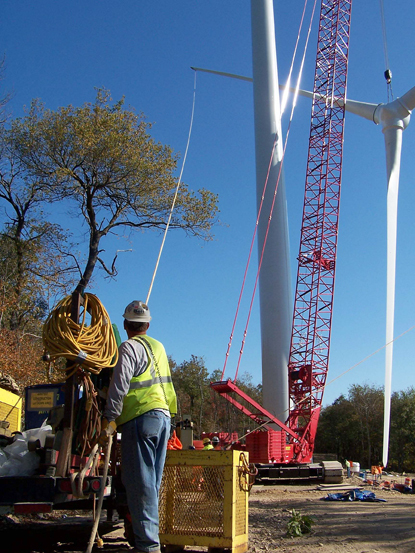 In addition to being Maryland's first major wind project, this is also the first wind power project for Constellation Energy, and for facilities manager Don Shilobod, whose background is in the operations and maintenance of coal and natural gas-fired power plants. Shilobod welcomes the challenge of the new technology. "While the Criterion project still involves generating power, some of the technology is vastly different. The power output is not constant, and that is a new learning curve. And learning about the equipment and technology that captures the wind and transmits that wind speed into electricity is new as well. "Wind power is great because it has zero emissions, but there are impacts that are not seen by the general public," he added. "People know that the wind does not blow all the time—that's a given. But there's the learning curve of knowing how snow and ice can impact your turbines in the winter. It can get to the point where it can become unsafe to operate the turbine if you have too much snow and ice on the blades. The added weight load can create problems with rotor dynamics. You could get a rapid increase in torque by snow and ice falling off the blade, with potential damage to the gear box assembly and gear box components. Wind power is not quite as easy as some people think." He adds, however, that it's clear renewable energy, such as wind power, has a place in the energy picture for utilities going forward.